Say hello to my latest food craving. You know the type of cravings that just kind of hit you out of no where? The ones that force you to go to the store ASAP to get everything you need to satisfy said cravings? Yep. 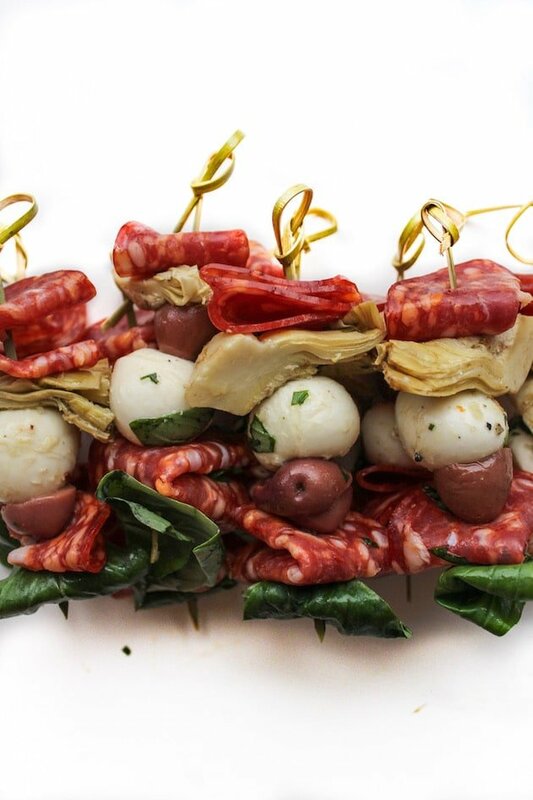 These antipasto skewers were 100% necessary. I’ve had appetizers on my mind a lot recently with the Super Bowl is this Sunday. My Pinterest feed has been bombarded with nachos, loaded fries, and every type of finger food you can imagine. Not that I’m complaining. To be honest though I’m not really a football person. While I love going to Super Bowl parties, I’m more in it for the food and the casual socializing. As for the game watching…not so much. At any rate – let’s get down to it. 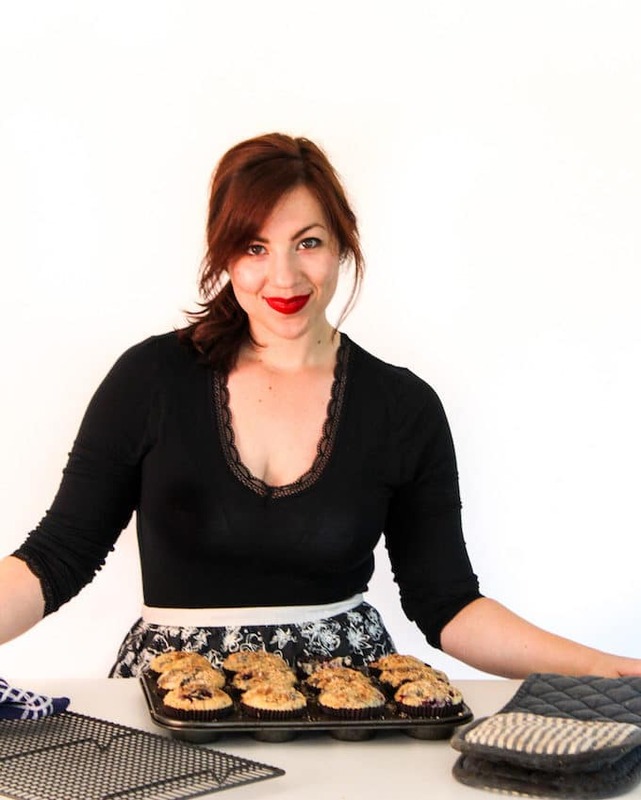 but you can really play around with your ingredients and mix and match what you’re working with. Switch up the basil for another herb, opt for feta in place of mozzarella, choose an alternative meat, whatever you want. This recipe includes marinated mozzarella for a little added zing but if want these in a pinch you can skip that step or look for marinated mozzarella balls in store. I recommend letting the cheese marinate for at least an hour for added flavor. Altogether that would take the prep time to about an hour and ten minutes since the actual assembly can be done in a snap. 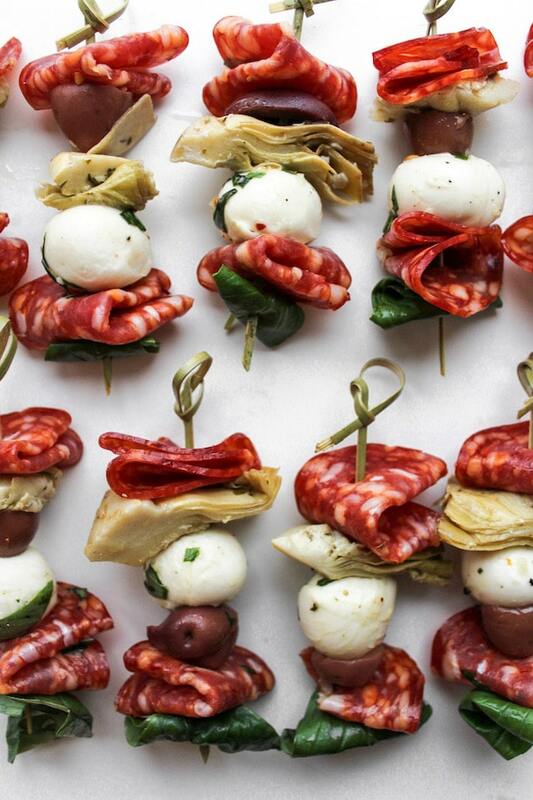 And most importantly – try not to eat too many of these antipasto skewers before your guests arrive! 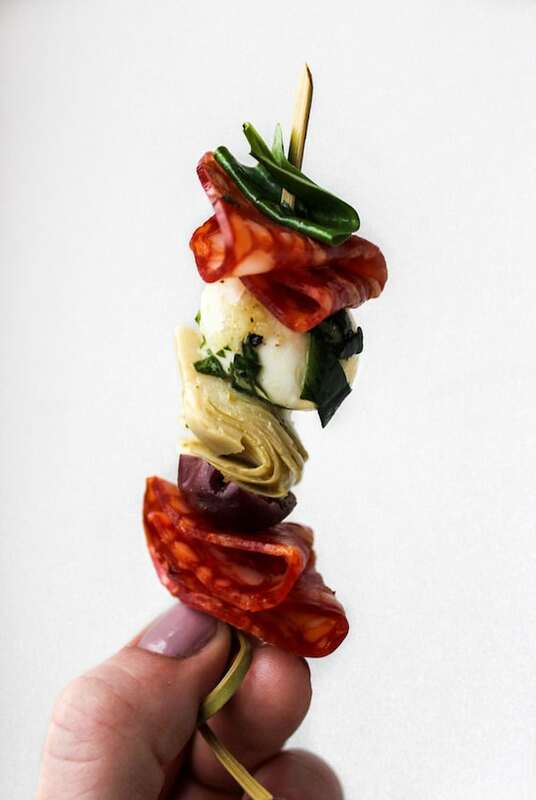 Don’t forget to #asaucykitchen on instagram if you make these antipasto skewers. We love seeing what you make! You can also post your pictures to our facebook page! Drain the liquid from the mozzarella balls and add then to a large jar or bowl. Add the olive oil, garlic, chopped herbs, lemon peel, salt and red pepper. Stir everything together to combine and then cover and refrigerate for at least an hour before eating. On a appetizer sized skewer add the folded pepperoni slices folded, artichoke hearts, olives, mozzarella, and folded basil leaves. Mix and match in whatever variation your prefer. Repeat until your skewers are filled. This recipe can be easily doubled if you need. 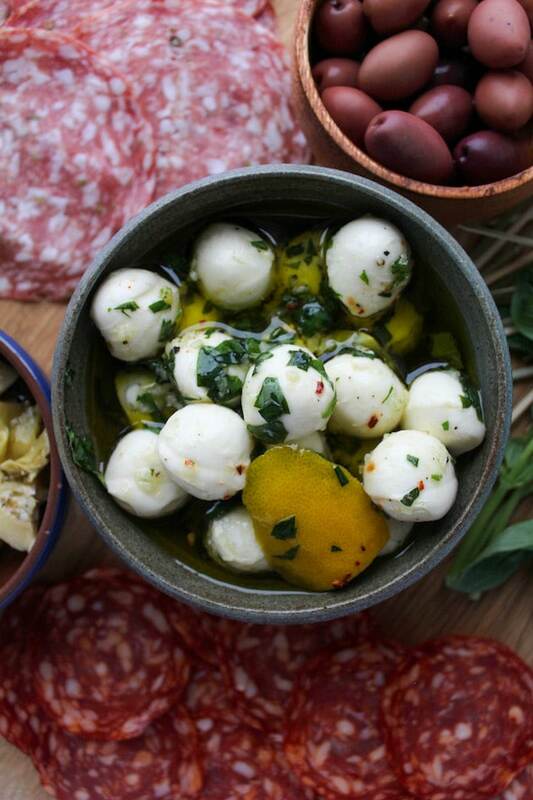 You can also look for marinated mozzarella balls in the grocery store if you want to cut down on prep time. How far in advance can I prepare these. I am catering my daughters wedding and hoping to prepare these a day before the wedding, so I don’t have to do much the day of the wedding. You can absolutely prep these the day before! I wouldn’t do it much sooner before that though because the fresh basil might start to look a little sad. Congratulations to your daughter!